You may believe that vinyl stickers and vinyl decals are pretty much the same thing. And we don’t blame you because let’s face it they are fairly similar, they’re just these cool sticky things that you stick on stuff, right? Well no, not quite. There is in fact quite a difference between vinyl stickers and decals. It mostly depends on the final product that you’re looking for really. To put it simply, if you’re looking for a simple monotone (one colour) design then a decal is what you want. However, if you’re wantingsomething a little more intricate and colourful then it’s a vinyl sticker. Allow our list below to elaborate on the differences which should clarify any confusion. What it looks like: Monotone in colour, usually smaller and less intricate. where to place all the cuts on the vinyl roll to create that design. What it looks like: Colourful and more complicated. which absorbs the ink, similar to that of printing paper. create the design. The entire sticker is cut out of the vinyl sheet. Essentially, the difference between vinyl stickers and decals lies in the vinyl printing and cutting methods. Your choice of decal or sticker depends largely on the intricacy and colour tones of the design. While we may not have plotters and professional vinyl weeders at all of our stores to produce vinyl decals, we do have vinyl sheets and printers that are capable of materialising any vinyl sticker design. 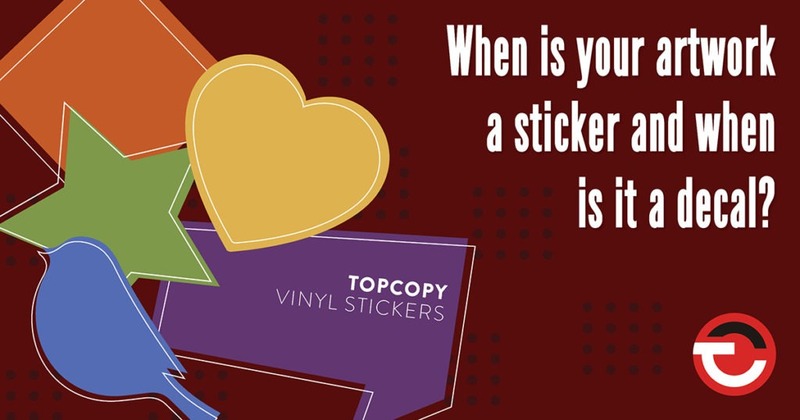 Get a TopCopy vinyl sticker quote now. This entry was posted in TopCopy and tagged colourful vinyl designs, difference between vinyl stickers and decals, TopCopy, TopCopy vinyl sticker quote, TopCopy vinyl stickers and decals, vinyl cutter, vinyl decals, vinyl printing and cutting methods, vinyl sheet, vinyl sticker design, vinyl stickers. How to create an impactful poster for maximum effect.